Getting your amp off the floor and tilted improves your mix. 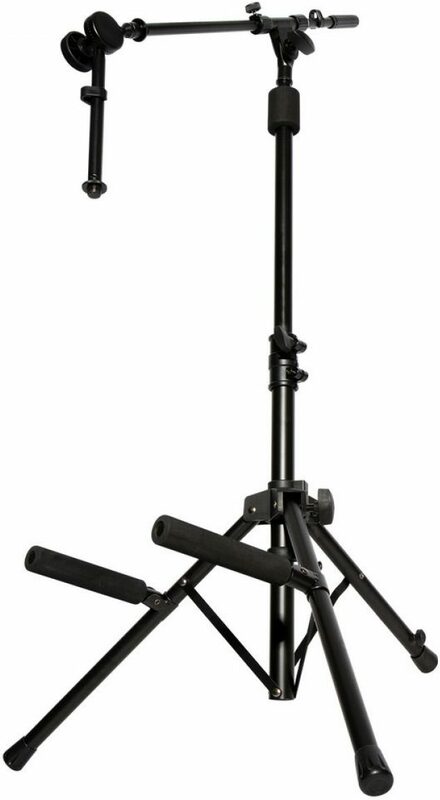 This On-Stage RS7501 Amp Stand with Boom Arm is constructed with a heavy-duty steel tripod base that adjusts to accommodate various sized amps. More importantly, it features 5 tilt positions that allow for optimal sound. The fold-and-go RS7501 is perfect for the road and it even includes a 5/8" threaded end allowing musicians to add a mic or boom. Both the black EVA rubber amp holders and foam padded collar that slides along the upper shaft protects the amp from scratches and dings. Now includes the MSA7500CB! A 22" boom arm with a 7" adjustable mini boom arm designed for use with the popular RS7500 Tiltback Amp Stand. Full articulation allows any style of microphone to be positioned for close or medium-distance miking. The proven Posi-Lok clutch design is safe to use with even the most valuable microphones. Includes 2 cable clips to secure loose mic cords. - Weight Capacity: 100 lbs. - Back Bumper Height Adj: 19-36"
- Mic Mount Height Adj: 23-37"
- Amp Support Arms Length: 7.32"
- Folded Dimensions: 5" x 4.5" x 26.5"